French Connection’s answer to the classic white shirt. 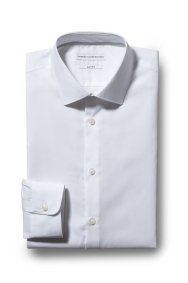 A simple white shirt is a failsafe and this one is cut for sharpness. It means you’ll look your best even without a jacket as the slim fit creates clean-cut definition throughout your frame. 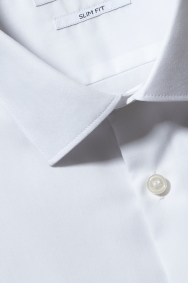 The 100% cotton material feels soft and breathable, so you’ll look sharp and feel comfortable at any event. Wear with any suit – that’s what timeless items are for. An expertly cut slim fit shirt sits close to the body and gently accentuates your physique but is more relaxed than an extra slim fit version. This is the shirt we recommend to set off a slim fit suit and create a crisp silhouette around the chest and shoulders. Ideal for business meetings and formal occasions, the perfect slim fit shirt is a must-have for any snappy dresser. Great value and good fit.